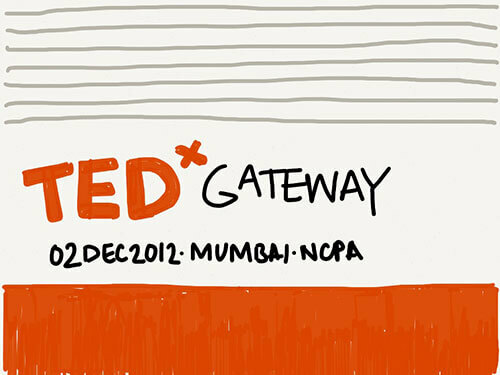 December 2nd saw the third edition of TEDxGateway hosted in Mumbai. 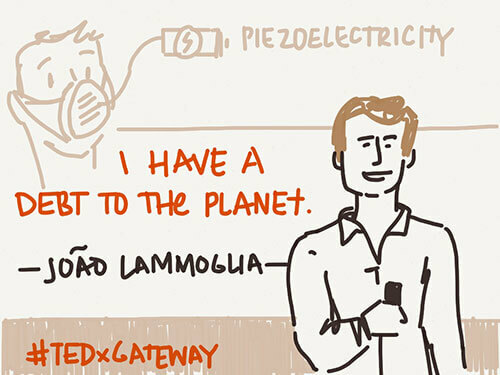 An independently organised version of the now famous TED talks, the day brought together 21 speakers from 17 different countries for the largest event of its kind in the city. Vikram Patel’s organisation Sangath works to expand mental health services in low-resource communities by training social workers to deliver basic psychiatric services to the millions who do not have access to medical professionals. 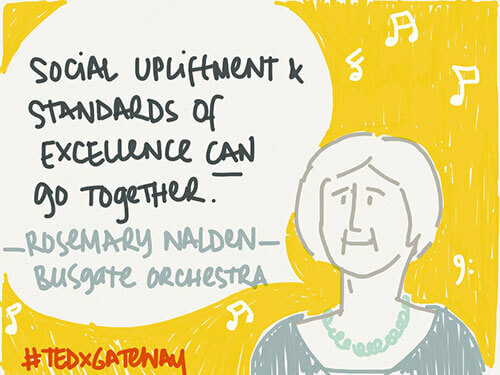 Rosemary Nalden’s *Buskaid provides musical education and training to hundreds of young musicians in South Africa’s poorest townships. Buskaid’s work brings music to the lives of children, giving them focus and opportunities that they would otherwise never be able to afford. Many of their students have gone on to become world renowned string musicians. Several talks during the day dealt with different approaches to solving crises of water, sanitation and education. 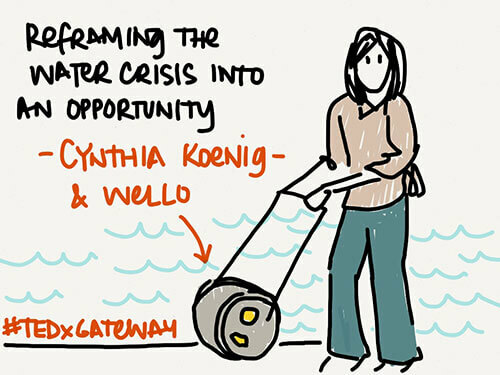 Anthropologist Cynthia Koenig’s Wello project looks to “re-frame the water crisis into an opportunity”. This was a demonstration of her Wello drum that can be used to carry water across long distances, thus relieving rural women the burden of carrying the family’s entire supply on their heads. We also had the chance to re-acquaint ourselves with Arunanchalam Muruganantham’s story, the challenges he faced in creating cheap, safe solutions for women’s hygiene products and how his determination prevailed to become a widely replicated business model for women’s self-employment. Another inventor Matt Johnson of Bare Conductive presented his conductive “paint” material that can be applied to any surface to create a circuit. This fascinating material opens up the possibilities for electronic developed intuitively using very simple principles. Their website has a great section on the work and explorations of people who have used their products to a wide range of inventive and expressive applications. 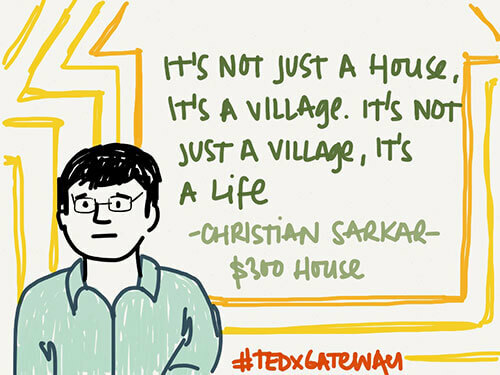 The $300 House Challenge started out as a competition by Christian Sarkar and Vijay Govindarajan as an inquiry to whether a safe, sustainable, functional house could be built with limited resources for the poor. The challenge attracted entrepreneurs, designers, architects, engineers and problem solvers from all walks of life in all parts of the world. While the competition may have ended, trials to implement some of the proposals are now underway in Ethiopia, Haiti and India. Could the results provide shelter to the millions who need it most? Well the teams leading pilot projects are certainly not giving up until they’ve given it a try. One of those horrible moments that occur in the life of a graphic designer who insists on his or her choice of font on a project is when a client asks “what difference is a font going to make”. The next time I get the question (we get it a lot at Kahani), I’m going to point them to the subtle and life-changing work of Abbie Gonzalez. 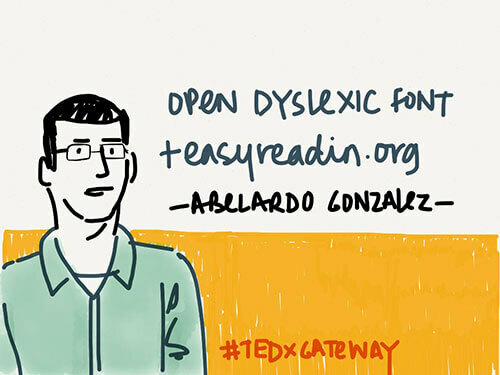 Faced with the trials and tribulations of “managing” dyslexia himself, Gonzalez looked for fonts that would making simple tasks like reading and writing easier. When he found that the available fonts were too expensive or impossible for individuals to purchase, he decide to create one. Taking it further, he decided to give it away. For free. The result is Open Dyslexic, an open source font that can be downloaded to most computers and is slowly being adopted for e-readers and tablets. This font has changed the way people deal with dyslexia and live normal, anxiety-free lives. How much difference can a font make? Plenty. 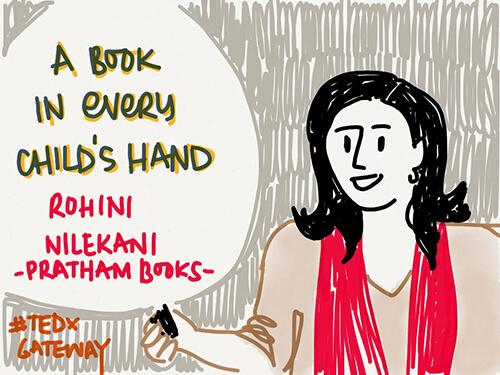 Rohini Nilekani, the founder of NGO Pratham Books spoke of their work in publishing books for Indian children and promoting the love of reading among children whose first language is neither Hindi nor English. They commission and translate original books into more than 10 Indian languages. In the meanwhile Ralph Simon from the Mobilium Group shared some of the unique ways in which mobile phone technology is being adapted to suit local and social needs in Asia. Artist Neil Harbisson was born without the ability to detect colour and sees the world in greyscale. This cyborg however “hears” colour using a device that transforms the spectrum of light (visual and invisible) into sound frequencies that he can hear. 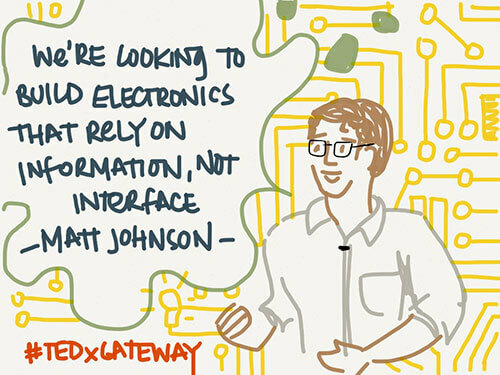 His Cyborg Foundation encourages others to expand and explore their senses, using technology to challenge the way we perceive the world. 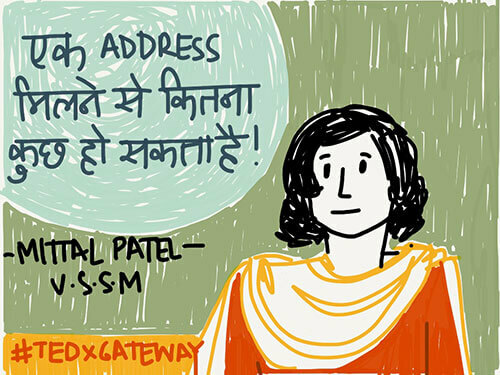 The soft spoken Mittal Patel founded the Vicharata Samuday Samarthan Manch to work for the rights of the nomadic and de-notified tribes of her homeland in Gujarat. Their efforts bring recognition to communities that have been marginalised since they were deemed “criminal” under 19th century British laws. Brazilian product designer João Lammoglia develops objects, tools and devices that are environmentally responsible. While many of his projects are at a conceptual level, those like the Aire Concept convert the force runners’ breathing into electricity that can charge mobile phones. 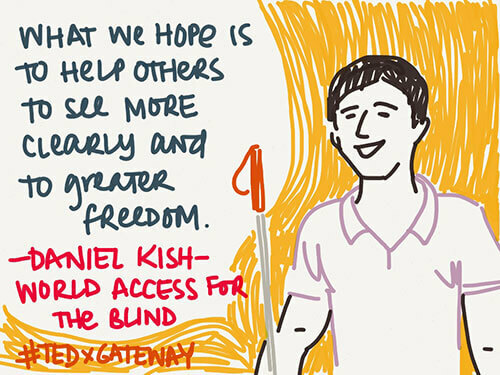 Daniel Kish, President of World Access for the Blind talked about his experiences as a blind person (including an unsavoury encounter with an Indian customs official). He introduced his technique of echo-location which enables people to “see” the world around them by the reflections of sound from surfaces in their environment. 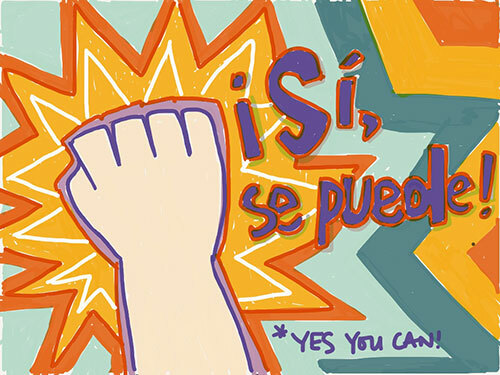 ..but a simple piece of encouragement for the disabled who want to lead independent, normal lives came from his former student: Yes, you can. 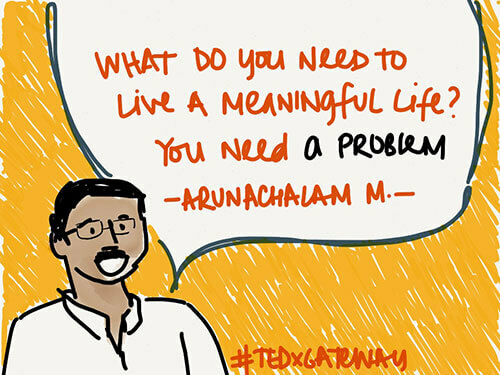 While the TEDxGateway met its organisers’ objective of sharing “unique ideas from India and all around the globe” it lacked a definition of purpose or the finesse of a curatorial narrative. Many of the presentations were made by very accomplished individuals but provided little opportunity for the larger community of gathered Mumbaikars to apply lessons to their own lives. Perhaps if the singular stories had had more relevance to the city or its concerns, the event could have proved to be a catalyst for conversations rather than comments. An entertaining Sunday nevertheless, but not always an engaging one. 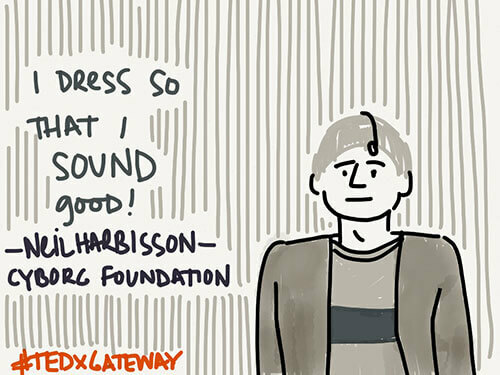 These sketches were created live at the TEDxGateway using the Paper app on an iPad. All sketches, text and material are © Ruchita Madhok, 2012 except where indicated otherwise. Please do not distribute in any form or medium without written permission. Really well done. Appreciate the effort you have put into making this. 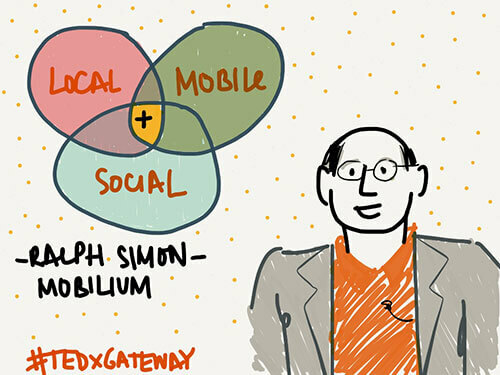 Would love to share the same with the global TED community via our conversation blog and Facebook. 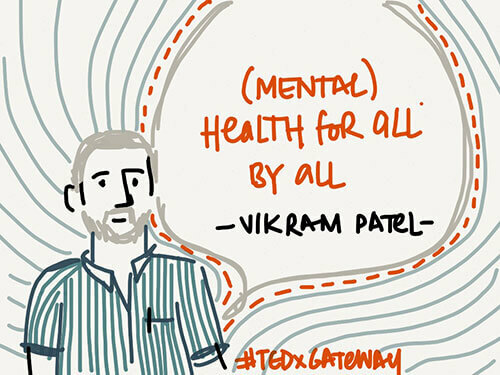 A delightful graphical representation of the speakers at TEDx Gateway.